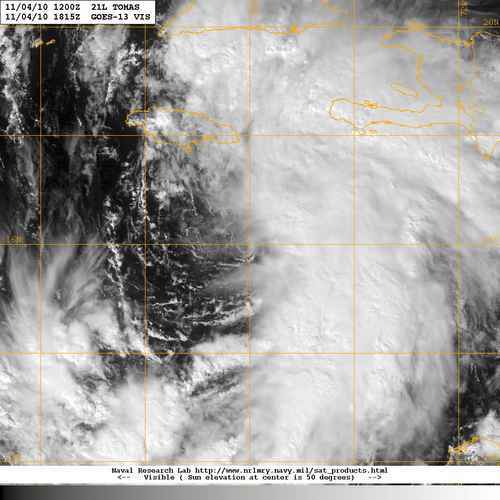 Tropical Storm Tomas: Strengthening at the wrong time! Tomas managed to survive its encounter with an adverse atmospheric environment for most of the day yesterday when it was barely a tropical depression. The system got better organized late yesterday and regained tropical storm strength. Today 4 November 2010 it has gotten better organized and stronger as its track has re-curved toward the north. This afternoon the system is already affecting eastern Jamaica as it moves toward the passage between eastern Cuba and Haiti with 55 mph sustained winds, which appear to be growing stronger. While it appears the system may avoid direct landfall in either Cuba or Haiti, it is clear both countries will sustain a direct impact from the winds and rains generated by Tomas with Haiti starting to get hit later on today and Cuba in the early morning hours on Friday 5 November. The biggest concern now is what adverse consequences will Haiti suffer as the storm impacts an area where large numbers of survivors of the January 2010 earthquake are living in tents and makeshift shelters, which is surrounded by deforested hills and mountains making it quite vulnerable to flash floods and mudslides as well as storm surge. The potential for a major human catastrophe is real.